Join in the LEGO® Elves 41195 Emily & Noctura’s Showdown, grab the Sword of Light and get ready to summon its power! Climb on Lumia the wolf’s back with Emily Jones and head off to find Noctura at her evil bat laboratory. Wait, what’s happening inside? Noctura is bringing her evil plan to life by creating hordes of bats! Be careful, she’s jumped in her carriage and is using her dark magic to chase after you. Can you win the day and stop Noctura’s plan? Price is 45% below the initial Lego retail price, a € 25.00 discount! This comes down to 4.61 cent per brick. The Emily & Noctura's Showdown (41195) Lego set is available from the sites below. However, they do not offer delivery to your selected region. 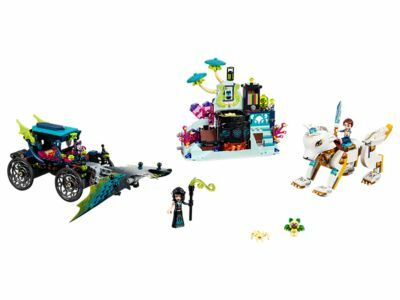 The Emily & Noctura's Showdown (41195) Lego set is no longer directly available from the sites below. However, 3rd party partners of these sites might still have the set available. Alternate description Help Emily Jones and Lumia the wolf face Noctura at her bat laboratory! Includes 2 mini-doll figures: Emily Jones and Noctura, plus Phyll and Myzo bat figures and a spider figure. Features a laboratory building with fireplace, magic cauldron with endless ingredients chest, function to make a bat appear, stairs to the cauldron, 2 hanging bat beds and 2 small nooks with movable spiderweb covers for the spider and ingredients. Also includes Noctura's carriage with flapping bat wings, 2 crossbow shooters and an opening roof, plus a fully posable and buildable Lumia the wolf figure with space for a mini-doll figure to sit. Also includes a Sword of Light. Accessory elements include Emily’s amulet, a stirring paddle, flower, bone, root, eye in a jar, bug in a jar, Noctura’s staff, 2 cherries, 2 spider webs, strawberry, drinking goblet, evil book page and a bat recipe. Stir the ingredients in the cauldron and push the button on the back to make a bat appear. Press the lever on the back of Noctura's carriage to flap the bat wings. Connect the evil bat laboratory to 41194 Noctura’s Tower & the Earth Fox Rescue to expand your LEGO® Elves fun! Lumia the wolf measures over 3” (9cm) high, 7” (18cm) long and 1” (5cm) wide. Noctura's carriage measures over 3” (8cm) high, 7” (20cm) long and 3” (9cm) wide. Laboratory measures over 5” (13cm) high, 6” (16cm) wide and 2” (6cm) deep.